Outings With a Toddler? Contours Bitsy Has You Covered! Who Says Diaper Bags Have to Be Boring? Weighted Blankets - What's the Hype? The Play Gym Built by Experts! We Took The Purina ONE® 28-DAY Challenge - Find Out What We Thought! Baby and Toddler Gift Ideas from Kidz District! #EscapeYourCommute with Essential Oil Blends! Start Your Holiday Shopping With Funrise Toys! The Only Stroller You Need To Read About! Who Is Going to #makeNOIZE This Winter With Cruelty Free Coats? One Kid Road Coat - the Patented Crash Tested MUST HAVE Coat! Top Recommended Books for Toddlers - by YOU! The hubby and I just celebrated our 1 year anniversary, and like most women, I struggled with what to get the man who has everything, coupled with the fact that I don't have a lot of time to make a sentimental gift with a newborn in my house. When I came across Luhvee Love Books I was super excited! Luhvee Love Books has books that you can gift to your grandparents, mom, dad, husband, teenager and even child... and here's what sets it apart from the rest - it's a fill in the blank book (Surprise surprise... the founder of Luhvee is a mother of 2! She gets the lack of sleep and found a solution to help us lol). It was SUPER easy to make and I finished making the book before the baby even woke up from his nap. I obviously chose the "Why I Love You" book for my husband, but I'm definitely eyeing the "I Love You Just The Way You Are" book for Zane for his first birthday. Setting up an account was quick and before I knew it I was starting on my book. The layout of the site makes it super easy to navigate, and you don't have to finish creating it in 1 sitting... You can save and come back at a later time which is super practical. I was able to easily upload pictures from my computer, and once uploaded, all I had to do was drag and drop them into place. What I loved the most however, was the fill in the blank part on each page. It made it SO easy to create the perfect sentimental gift without having to sit and think about finding the perfect words (which seem to be harder and harder to find as I become more and more sleep deprived). I've made a lot of other picture books in the past, and having the ability to add captions that are already thought out for you is a game changer. This page for example, had the caption: Your greatest gift to me... and I filled in the rest! How easy is that? 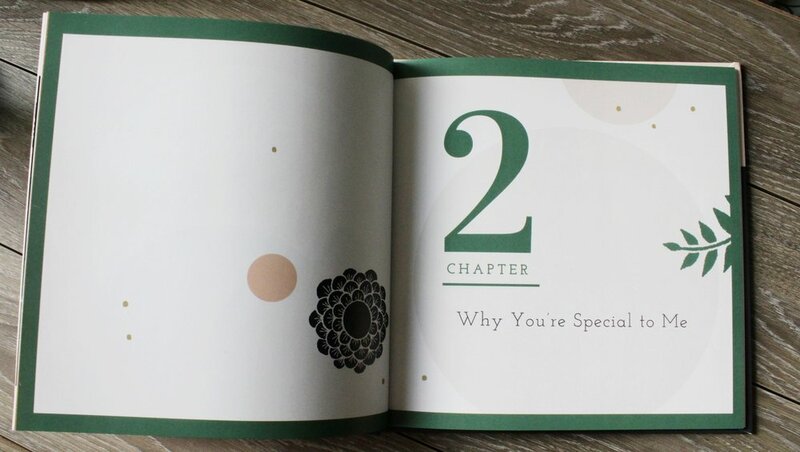 The book I chose was divided into 4 sections: When We First Met, Why You're So Special To Me, Our Life Together and My Everlasting Love (how cute is that!?) and the fill in the blanks were perfectly suited to each section. You were also able to create your own text if you couldn't think of an appropriate answer for the fill in the blank! I definitely recommend Luhvee Books. 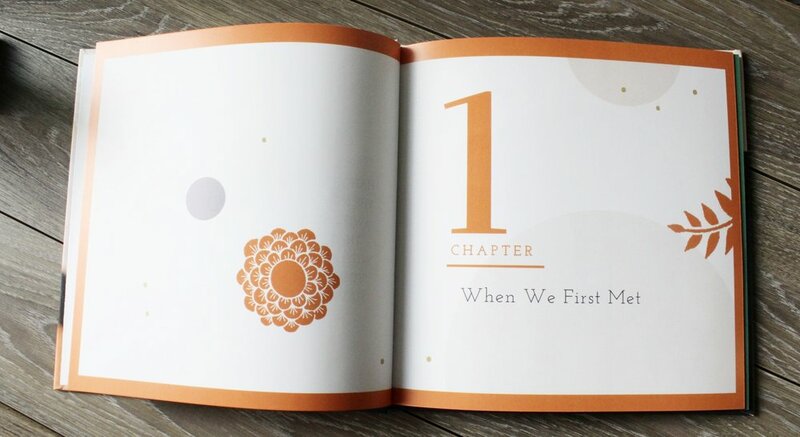 From start to finish it was an easy process, the book was delivered in less than a week, and the fill in the blanks made it so easy to create the perfect gift. My husband was laughing as he read each caption and couldn't believe half of the memories I had shared (which I might add I would have never probably remembered without the fill in the blanks)! Thanks Luhvee! If you visit their site now, you can save using the promo code: TOVAH20. ** Whether it's for an anniversary, a first birthday, Mothers Day or Fathers Day... this gift is guaranteed to impress and leave a lasting impression. I honestly can't wait for Zane to old enough to look through this book one day! **Only one coupon code is redeemable per person. Code is not redeemable for cash. The offer will expire 12/31/17 at 11:59pm. EST. This offer can not be combined with any other offers. Fill Out The Form Below For More Info About Joining My Team! What are you looking for? * Sign up for the monthly newsletter Join your team and make some $$$ I'd like to collaborate! Check out my past blog posts! Mar 31, 2019 Outings With a Toddler? Contours Bitsy Has You Covered! Mar 28, 2019 Who Says Diaper Bags Have to Be Boring? Mar 27, 2019 Pamper Yourself With Dearfoams! Mar 19, 2019 Weighted Blankets - What's the Hype? Mar 18, 2019 The Play Gym Built by Experts! Feb 21, 2019 We Took The Purina ONE® 28-DAY Challenge - Find Out What We Thought! Dec 5, 2018 Baby and Toddler Gift Ideas from Kidz District! Nov 15, 2018 #EscapeYourCommute with Essential Oil Blends! Nov 8, 2018 Start Your Holiday Shopping With Funrise Toys! Oct 31, 2018 The Only Stroller You Need To Read About! Oct 27, 2018 Who Is Going to #makeNOIZE This Winter With Cruelty Free Coats? Oct 25, 2018 One Kid Road Coat - the Patented Crash Tested MUST HAVE Coat! Aug 4, 2018 Top Recommended Books for Toddlers - by YOU! Jun 10, 2018 Fave 3 Low Carb Keto Products of the Week! Jun 6, 2018 Make a Gazillion Memories This Summer! May 28, 2018 Perch Hanging High Chair Review! May 1, 2018 Drugstore vs. High End Makeup - Is There Really A Difference? Apr 27, 2018 Neutrogena To The Rescue This Summer! Apr 12, 2018 Diaper Caddy Essentials! Apr 10, 2018 Best Leggings Under $25! Mar 11, 2018 5 Awesome Loot Bag Ideas for Babies and Toddlers! Mar 10, 2018 Baby Bundles from The Children's Place! Mar 5, 2018 Puzzles, Educational Games and More from Mudpuppy! Feb 2, 2018 Urthbox - the Healthy Snack Subscription Box! Jan 26, 2018 This 2-in-1 Travel and Play Tent Will Save Your Summer! Jan 16, 2018 Healthy Homemade Dog Treats! Jan 15, 2018 Collagen Peptides - What's the Deal? Jan 2, 2018 Check Out My Results After Using White With Style! + Promo Code for up to 90% off! Dec 23, 2017 Function of mrsnewmommtl - Personalized Hair Care with over 12 Billion Formulations! Dec 21, 2017 Lounging in Style! Dec 15, 2017 From Dragons to Princesses to Farms... You Will Find It All at PLAYMOBIL! Dec 13, 2017 Support a Company That Gives Back to Children This Holiday Season! Dec 1, 2017 Spoil the Man in Your Life in Time for Travel Season with the American Crew Travel Pack! Nov 28, 2017 Colicky or Gassy Baby? Philips Avent Can Help! Nov 19, 2017 Introducing Finger Foods with Mushies! Nov 14, 2017 DIY Baby Abstract Art! Nov 9, 2017 Let's #MakeNoize this Winter with Cruelty Free Winter Coats! Nov 6, 2017 Shaking Our Way Through the Week with Baby Gourmet! Nov 5, 2017 Dapple On the Go! Nov 3, 2017 Dapple in the Kitchen Gives Me Peace of Mind Thanks to Their Plant Based-Ingredients! Nov 2, 2017 Versatile Distressed Top from PinkBlush! Nov 1, 2017 Philips Avent Ear Thermometer - It's so Quick, Your Children Won't Even Know You've Used It!! Oct 31, 2017 Giveaway - One Kid® – Crash Tested Winter Coats and Snowsuits! Oct 27, 2017 Black Friday Sales All Month Long at Canada's Baby Store! Oct 25, 2017 I Successfully Cooked My First Meal for Zane Thanks to Béaba Babycook®!!! Oct 12, 2017 Stella & Dot - Gorgeous,Versatile & Affordable Accessories For Any Occasion! Oct 11, 2017 It's Cutout Season with PinkBlush! Oct 9, 2017 A Review of 2 of VTech's Newest Baby Monitors! Sep 28, 2017 Sweater Weather Has Arrived with PinkBlush! Sep 26, 2017 Tommy the Turtle™ is a Step Above the Rest! Sep 25, 2017 The Wiggles - Coming to Quebec City & Montreal! Sep 24, 2017 Kute n' Koo Backpack Diaper Bag + Giveaway! Sep 20, 2017 VTech's Pop-a-Balls™ Drop & Pop Ball Pit™ is a Total Hit! Sep 18, 2017 Need a Unique Gift Idea? Look no Further! Sep 14, 2017 bblüv Üvi 4-in-1 UV Sterilizer for Pacifiers, Bottles and Sippy Cups! Sep 12, 2017 Merino Kids Go Go Bag - The Award Winning Sleeping Bag! Aug 12, 2017 Slowing Down Time with JORD Watches - Contest! Aug 4, 2017 Hny Baby Bandana Drool Bibs to the Rescue! Jul 20, 2017 Zane's Room - My First DIY Success! Jul 13, 2017 So'Pure Teething Colo'rings to the Rescue for Teething Pains! May 29, 2017 5 Mommy Hair Hacks That I Swear By!